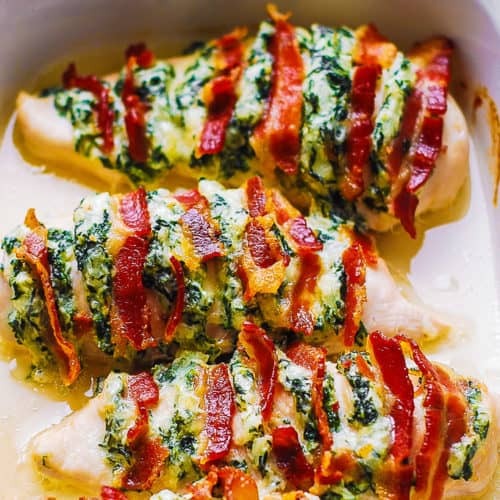 This easy and delicious Hasselback Chicken is stuffed with Spinach, Parmesan, Mozzarella, Cream Cheese, and Bacon! Low-carb, gluten-free, KETO friendly meal! One-pan family meal made in a casserole dish. Do you enjoy delicious and flavorful low-carb and KETO recipes? 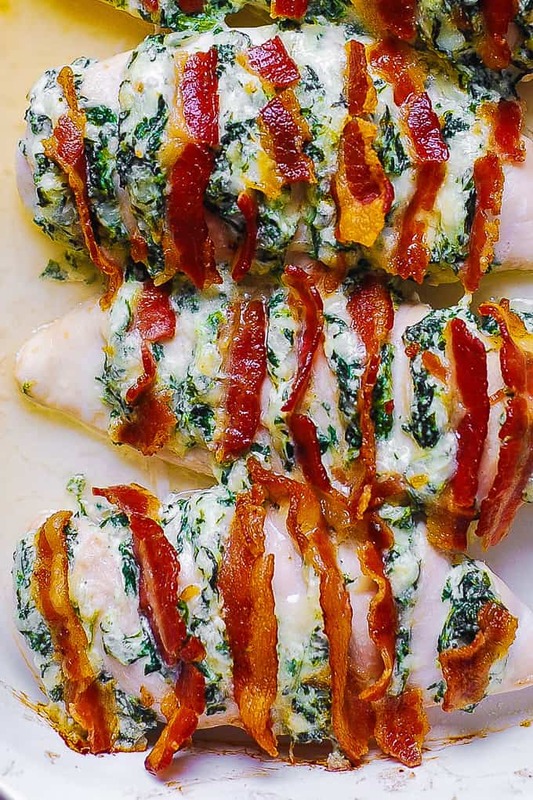 Then, this Hasselback chicken with cream cheese, bacon, and spinach is what you’re looking for! It’s packed with protein, low in carbs and perfect for KETO diet. You will also enjoy bacon cream cheese chicken and baked Ranch chicken with broccoli and bacon! What is the origin of the term Hasselback? Usually, we use it in reference to Hasselback potatoes – a traditional Swedish side dish. How is it made? The potato is sliced about halfway through into thin slices. Then it’s topped with butter and other toppings and baked until crispy. Hasselback potatoes originated from Hasselbacken Restaurant in Stockholm. 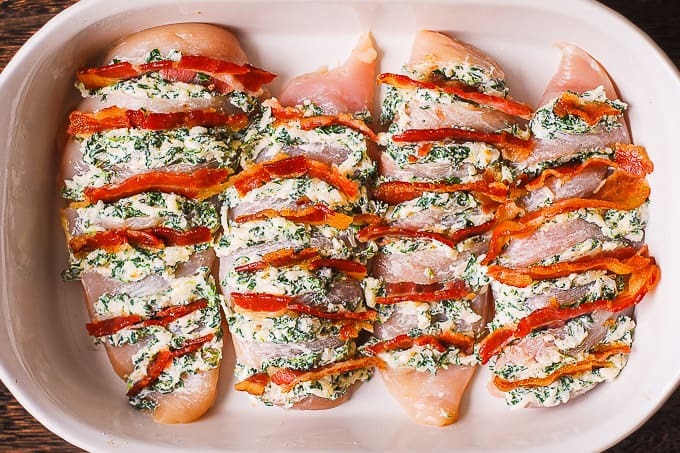 What is Hasselback chicken? 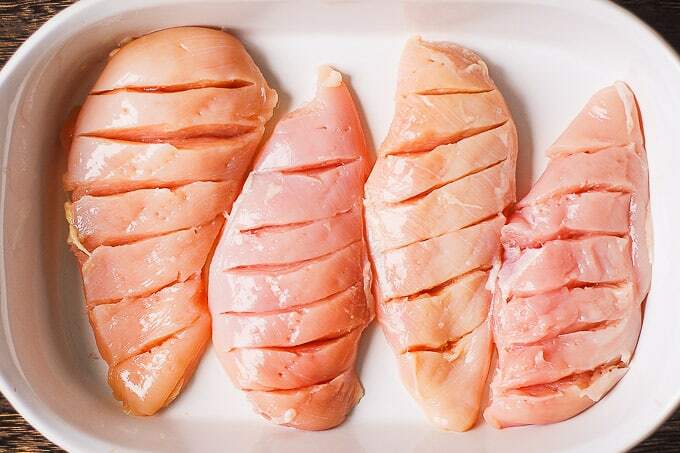 The chicken breasts are slit halfway through into thin slices that are still connected at the base. Do not cut all the way through the chicken. The slits are then stuffed with the delicious toppings. And, the chicken is baked! What is the best chicken stuffing? The spinach dip and bacon! 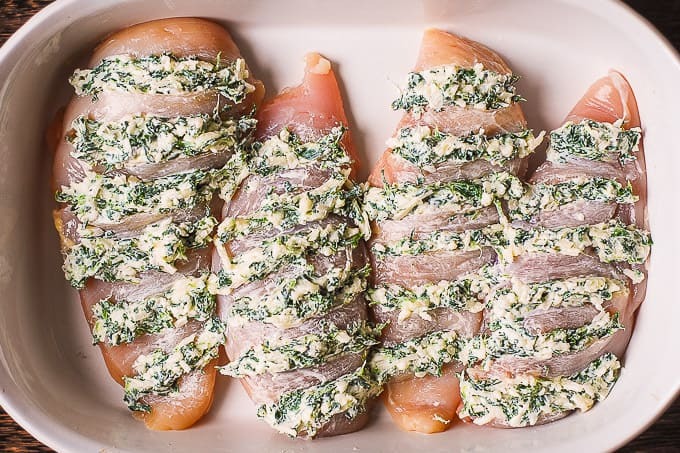 Cream cheese, Parmesan, Mozzarella, and Spinach goodness is stuffed into the slits of Hasselback chicken. 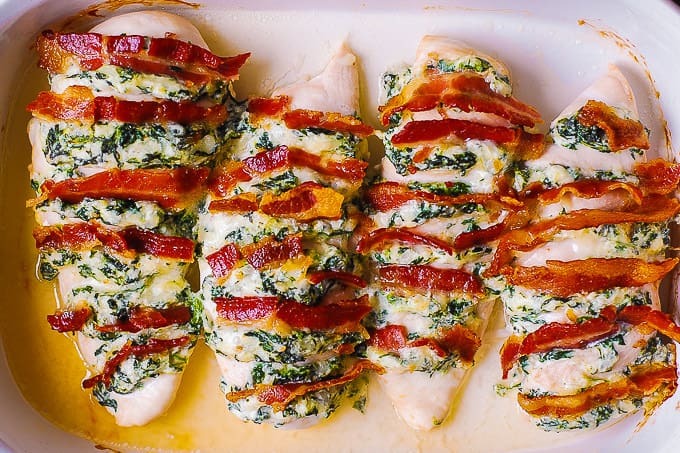 You can also stuff the chicken with just cream cheese slices and cooked bacon. What you get is a creamy cheesy chicken with lots of savory flavors! The chicken breast is tender and moist thanks to the stuffing. Quick and easy! Just carefully make the slits in the large chicken breasts. Then, stuff the chicken! You get the spinach cream cheese dip + bacon with every bite! Versatile! Make your own spinach dip or you store-bought one! Or, use any other cheese dip. This recipe is also great if you want to use up any leftover spinach dip or other kinds of cheese dip. This Hasselback chicken is gluten-free, low-carb, KETO friendly recipe. It’s a one-pan meal! Made in a casserole dish! Only one pan to clean. 2) Use large chicken breasts. They are easier to handle when making slits. 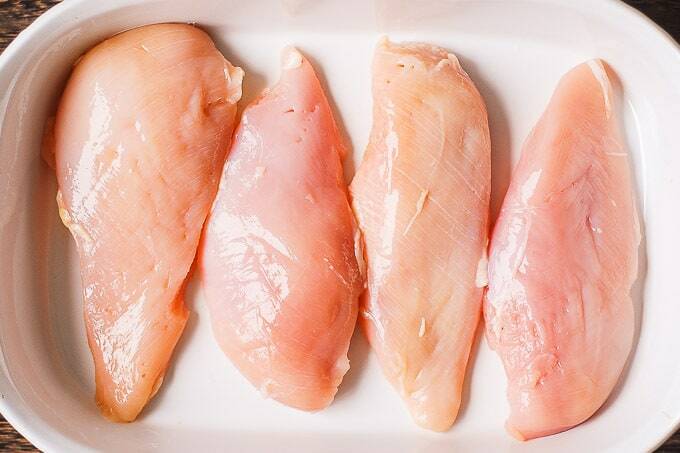 3) Slice the top of each chicken breast. Make about 6 slits on top of each chicken breast, going 3/4 way down, without cutting it through. 4) Add chicken breasts to the casserole dish. 5) Mix spinach dip ingredients together: cream cheese, Mozzarella, Parmesan, spinach, minced garlic. 6) Fill the slits with the spinach dip. You will only use half of the dip. 7) Slice cooked bacon horizontally into shorter slices. Slide them into slits. Or, just place them on top of chicken. They will pop out anyway when cooking. 8) Cook at 375 F for 20-30 minutes until the Hasselback chicken is cooked through. Use large chicken breasts. They are easier to use for Hasselback chicken. Make about 6 slits on top of each chicken breast. The slits should be made halfway through or 3/4 way down and still connected at the base. Do not cut all the way through the chicken. Use cooked and drained bacon slices. Stuff the chicken in the casserole dish to minimize the mess. 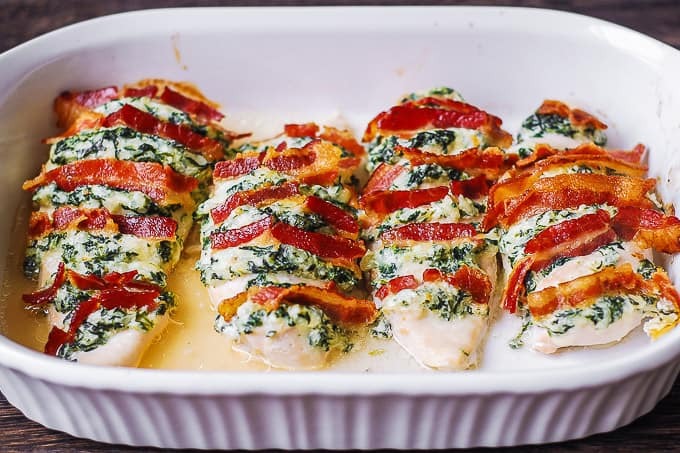 Hasselback Chicken with Bacon, Cream Cheese, and Spinach is a delicious one-pan meal made in a casserole dish! 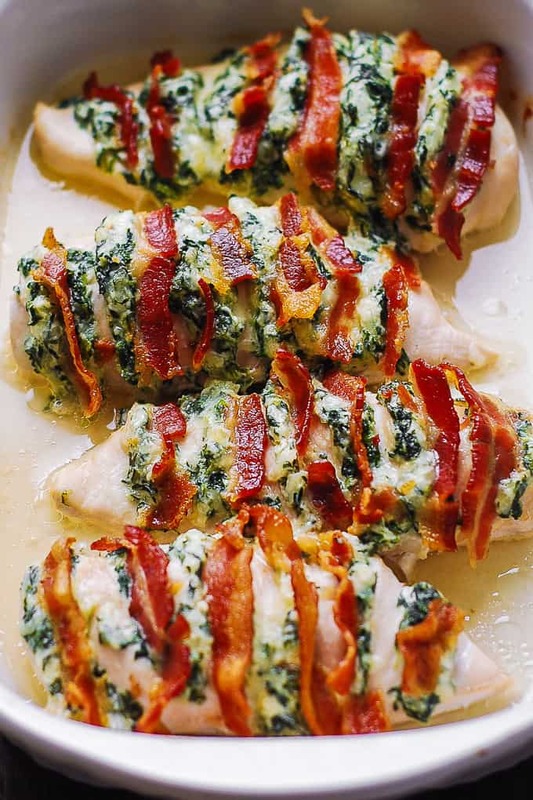 The chicken is stuffed with Spinach Dip made with Parmesan, Mozzarella, and Cream Cheese. High in protein, low in carbs. Gluten free, KETO friendly recipe. Mix spinach dip ingredients together. Add salt to taste. Slice the top of each chicken breast. Make about 6 slits on top of each chicken breast, going 3/4 way down, without cutting it through. Add chicken breasts to the casserole dish. Fill the slits with the spinach dip. You will only use half of the dip. Slice cooked bacon horizontally into shorter slices. Slide them into slits. Or, just place them on top of chicken. They will pop out anyway when cooking. Cook at 375 F for 20-30 minutes until the chicken is cooked through. Chicken turned out amazing and wasn’t too dry at all! My kids even loved it! (Ages 6 and 11) I did have to increase the cooking time by a bit. But overall a fantastic recipe that we will definitely make again! So glad you tried this recipe and liked it! Thank you for your feedback!